Wooden or stone gates, known as paifang in Mandarin, were originally used to separate subdivisions in Chinese cities. Eventually, these gates lost that role, and their doors, remained but as monuments. In Canada today, these gates are often the most visible representation of Chinatown in our cities, symbolic of cooperation between various levels of Canadian and Chinese governments, businesses, and citizens. Victoria’s Gate of Harmonious Interest, built in 1981, stands in the heart of Canada’s first Chinatown. The gate blends traditional and symbolic elements and features hand-carved stone lions from Victoria’s sister city, Suzhou. One pillar commemorates Chinese Canadians who fought and died in World War II. In Vancouver, the Millennium Gate, built in 2002, was inspired by the Inner City Gates of 19th and 20th century Beijing. It combines Eastern and Western designs to represent the past and future of the community. The Chinese Gate in Edmonton benefited from the expertise of Chinese architects and craftsmanship from the sister city of Harbin. Built in 1987, the gate features traditional Chinese motifs, colours, decorative tiles and ornate lighting. Founded in 1909, Winnipeg’s Chinatown is one of Canada’s older Chinese communities. The gate, built in 1987, is a pedestrian overpass that connects and complements the Dynasty and Mandarin buildings. Located at the entrance to the Mississauga Chinese Centre, this city’s timber gate was constructed solely with traditional wooden studs. Cooperation between China and Canada is demonstrated in the government support and construction expertise that made this gate possible. The Zhong Hua Men Archway, standing at Gerrard East and Hamilton streets in Toronto’s Chinatown East, was built thanks to many Canadian and Chinese partners. The gate honours Chinese Canadian settlers, particularly those who laboured on the transcontinental railway. Built in 2010, the Ottawa Chinatown Gateway, featuring nine roofs, is a royal Chinese arch that can only be built in capital cities. The gate has good-luck symbols embedded within, including five Chinese coins, one of which is at least 1,000 years old. Montréal’s Chinatown actually has four gates – North, South, East and West. The North Gate on the stamp was donated by the city of Shanghai in 1999. 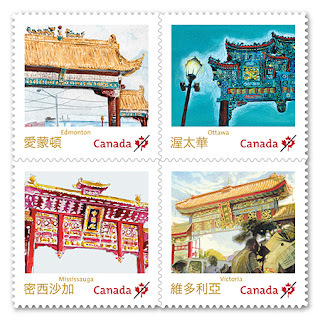 To create these stamps, eight illustrators across the country took to their communities to create watercolour paintings of the gates. Stamp designer Hélène L’Heureux of Interaction/design then used these images to create unique stamps that work together as a set. To enhance the issue, L’Heureux found the answer in traditional Chinese coins and designs.